Maxim Rysanov performs at West Vancouver’s Kay Meek Centre on Sunday, October 16 at 3:00pm. His repertoire includes Bach’s Suite no. 2 in D minor, Schubert’s Arpeggione Sonata, and Franck’s Sonata in A major. Call Cory at the Vancouver Recital Socity to book tickets: 604-602-0363. 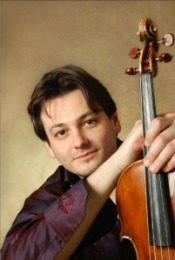 Maxim Rysanov describes how he was introduced to the viola. It didn’t take long for this “prince among violists” to achieve success and acclaim. In September 2010 he performed Tchaikovsky’s Rococo Variations at the Last Night of the Proms with conductor Jiri Belohlavek and the BBC Symphony Orchestra. Maxim Rysanov performs at Kay Meek Centre on Sunday, October 16.